Here's a piece about Bihu and pitha I'd written a long time ago, for somewhere else. Magh Bihu is in January, so I've got my timing wrong. But I'm going to Assam next week and I was feeling nostalgic, so you get to share in. The Assamese celebrate Bihu thrice a year, but each Bihu has a different significance. The one in April is celebrated with music and dance and marks the beginning of the Assamese New Year. The one in mid-October is a time of solemnity and prayer, as farmers and their families wait out the season until harvesting begins and food becomes plentiful again. The one in January, Magh Bihu, was always my favorite because it’s marked, above all, by feasting. And the one delicacy that’s prepared in most houses during this time (or was, because it’s by no means easy and making it from scratch is becoming ever more rare) is the pitha. 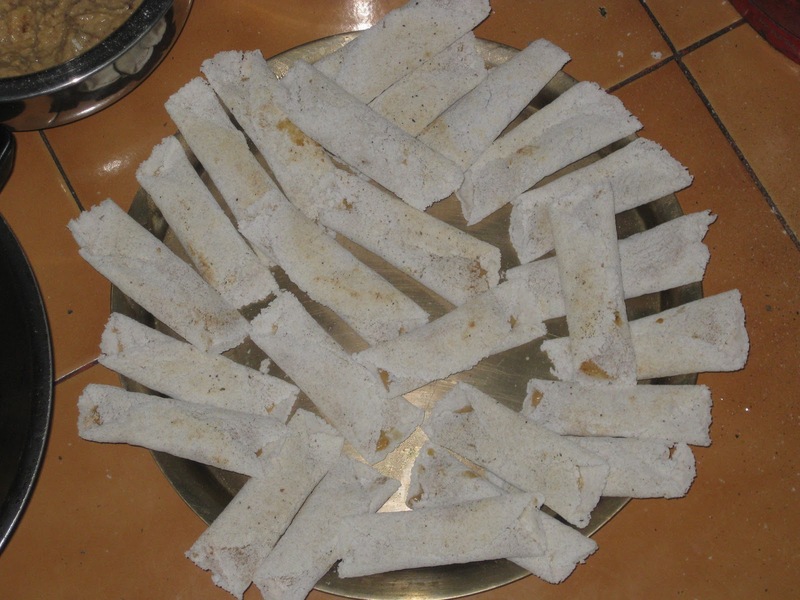 Pitha is the name for not just one item but a variety of them all prepared using rice flour as the primary ingredient. 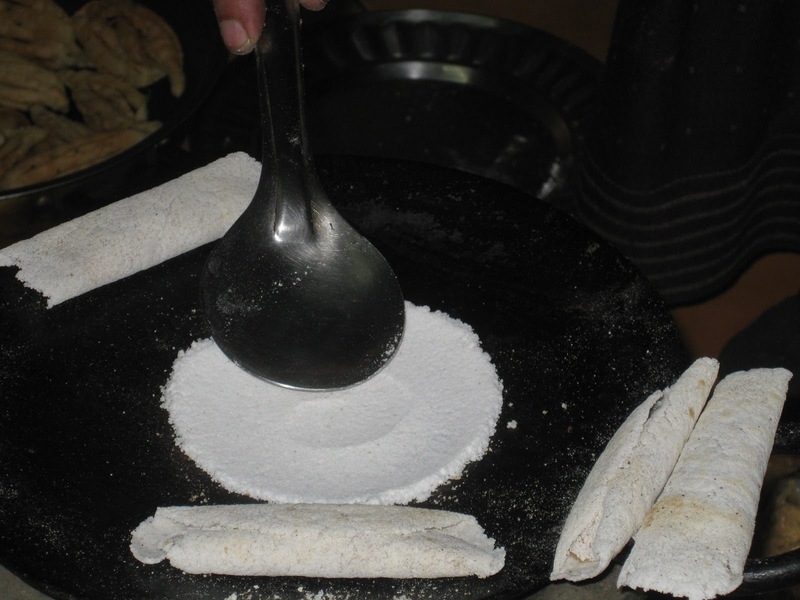 There are some varieties of pitha that you can make in any season, but some can only be prepared with flour from a special kind of rice (bora saul) that you only get at this time of the year, so these are what I feel nostalgic about each year as January rolls around. And making these from scratch is a long laborious process. When I was a child, my mother used to buy the rice a week in advance. Then she would grind it herself with the aid of a large wooden pestle and mortar. My sister’s and my services were also enlisted, and while I was too young to make more than a few dents in the rice with the heavy pestle, I eagerly worked up on the sesame seeds, beating at them till the black peels yielded the tiny white seeds. Then, a couple of nights before Bihu, my mother would set out all the ingredients and get to work actually preparing the pitha. The idea is to make a kind of crepe with the rice flour and stuff it with something sweet—usually ground coconut or sesame fried with sugar or jaggery, but my mother had a special filling that she prepared by sweetening milk and boiling it until it became thick and messy. 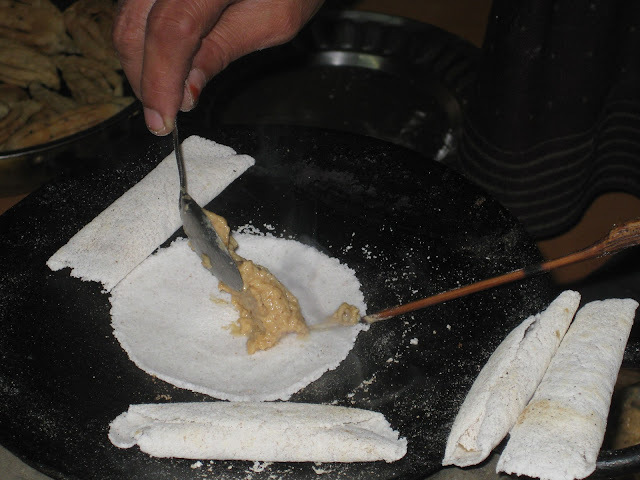 So how do you make pitha? You start with a flat pan. The pan has to be really hot and dry. You take a tablespoonful of the rice flour, pour it onto the pan, and quickly pat it into a small round flat pancake with the spoon. This has to be quick—all that holds the cake of flour together is its own stickiness and the heat—and if you’re a second late your pitha is ruined and you wipe off the pan with a clean rag and start again. Take your filling and ladle a little onto the cake, right down the middle from end to end, as if marking the diameter. 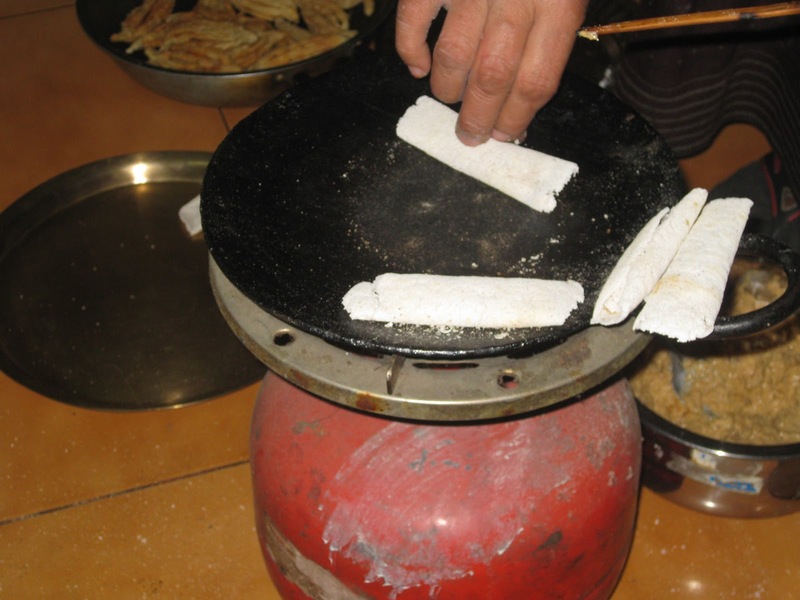 Use a long spoon or something similar to wrap both sides of the pitha onto itself (my mom used a knitting needle), and shove it off to the end of the pan to cook for a while and allow you to make the next one. My mom made large batches of these to share over the next few days with neighbors and relatives, but the taste of a hot pitha just off the stove is something else altogether. I suspect my staying up late at night to watch her create them and then being rewarded by having as many as I wanted had something to do with it. My mother still makes these every year, though she has long since given up her pestle and mortar and now buys rice flour. She sends some to me too, though they arrive much battered by their travel, and look little like the smooth ivory morsels I remember. Last year, after several years, I got to pick hot pitha off her pan again. They are delicious. Especially eaten hot, though these are meant to store and rarely eaten hot. I would go through about a dozen while they were on a plate, cooling off. Have fun on your vacation Unmana. I envy you. I've been wanting to go to Assam for a long time. In fact everywhere in the NE. Was so close a couple of times but have had to cancel my tickets the last minute. Anyway, hope to see more pics of your hometown. Gunjan: Thank you. Unfortunately will not have time to travel this time. But Guwahati should be nice too. And may your Assam trip work out soon! Come with us next time?